Information About PCstats.com PCSTATS - PC Hardware Reviews and Guides - Get The 'Stats and Stay Informed! PCSTATS began in the fall of 1999 and is now a leading online technology publication which provides in-depth reviews of a broad range of computer hardware. Through a mixture of the latest hardware reviews and daily news briefs, the weekly PCSTATS Newsletter, PCSTATS Beginners Guides and the PCSTATS Forums, PCSTATS.com has become a trusted resource for the IT industry, business user and mainstream consumer alike. Readers use PCSTATS to scout out information and benchmark reports on the latest desktop computer hardware components, and for tips and tweaks to enhance existing computer systems in support of legacy and emerging technologies. Since its inception, PCSTATS has generated a positive reputation within its industry for fair and meaningful hardware evaluations, information that empower its readership to make informed purchasing decisions. By providing our readers with a broad range of computer focused content, PCSTATS (www.pcstats.com ) seeks to maintain that position. ), Casale Media (apply here), Suite 66 (apply here). In the spring of 1999, the PCSTATS that you know today began under a completely different name. It was the height of the dot.com boom, and our original name had just been registered with Network Solutions. The website was going through its BETA trials, and the very first article (bout a totally self contained liquid cooling PC) had just been published. It was a watercooled 'Celly' 300A @ 468MHz, right when overclocking really began in earnest. Anyhow, executives at another company came upon our fledgling website when they misspelled their companies' address, adding an extra "s" right before the ".com". Domain names were a bigger commodity in those days. That single "s" quickly became a point of contention, and after much negotiation an agreement was reached and ownership of the domain transferred to them. Dozens of hardware-this.com and overclocking-that. com websites were popping up each day back then, but such niche enthusiast names were thought to be untenable in the long term. Today, roughly 75% of those websites no longer exist. It was decided that the companies' next name would contain "PC" - a widely accepted tech terminology then, and now. It was then just a matter of search and discovery... PChardware, PCzone, PCworld... and so on and so forth. "PC" and "Statistics" came together nicely, and the hybrid "PCSTATS" signified an approach to objective analysis of computer gear based on how it actually performs. Thus, a short and sweet seven letter website name was born! Since 1999 the PCSTATS logo has gone through a few changes, with our most recent brand identity coming into effect in early 2003. Even the way in which PCSTATS is written has evolved; at first it was "PC Stats," and then shortly thereafter "PCstats" or "PCStats." Today, the accepted way to write our name is "PCSTATS", with all capital letters and no spaces. PCSTATS has three awards of distinction that it hands out to products with varying degrees of merit. These awards are rarely handed out, as it is our opinion that an 'Editor's Choice Award' should be more than just a rubber stamp included with every single review. When awarded, the icons will be located on the last page of the review to signify the outstanding attributes of the product under evaluation. The 'Editor's Choice Award' is PCSTATS highest mark, and it is only ever given to products that the editorial staff would actually buy themselves. If you see this award, you're looking at some of the best hardware in its class. Performance and features are given preference in this situation, but price must also be reasonable. The 'Recommend Product Award' applies to good all around computer hardware. It doesn't have to be the best out there, just as long as it is priced competitively, offers good bang for that buck, and has a good solid feature set. If the editorial staff at PCSTATS would recommend the product in question to someone we know, then it gets this award. The 'Best Buy Award' is given to hardware which is extremely affordable, but also has pretty good performance or features. Budget hardware generally lacks a lot of extra's, but that doesn't mean it doesn't have a lot of value. It's PCSTATS way of indicating good cheap computer gear is a great buy. What does it mean if a product doesn't get an award? Nothing. Read the review carefully and you'll soon understand how well or how poorly that product performs. Just because it doesn't get an award doesn't necessary mean you shouldn't consider it. PCSTATS holds back on its awards as much as possible, so they count - after all, there's not much point in handing out 10 awards to ten identically fast motherboards now is there? PCSTATS is a dynamically generated website with hundreds of thousands of individual pages of database driven content. The publication back end of PCSTATS relies on the Rydium|Ware Spark Content Management System (CMS). Spark is a proprietory CMS engine, and has been in development on a continuing basis over the years to suit the changing demands of mixed text/image heavy content, emerging advertising standards, and advancing search engine indexing requirements. The Spark CMS engine is coded in the ColdFusion programming language. ColdFusion is an application server and software based development framework used for the production of dynamic web sites. It was originally developed by Allaire, which was bought out by Macromedia, which then merged with Adobe. The PCSTATS back end hardware component is composed of multiple ColdFusion application web servers which communicate with a dedicated database. Network infrastructure is configured to support this architecture, and feeds out to the Internet via a 1000Mbps pipe. 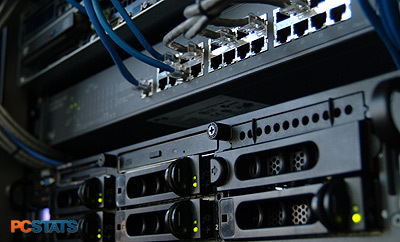 PCSTATS hosts its servers with Elite Internet Communications Inc. (www.eicomm.net). EICOMM has proved itself a reliable hosting facility, and its services come recommended by this website. PCSTATS is powered by multiple 1U Rackable Systems C1000 webservers and a 3U Dell Poweredge 2850 database server. All servers are powered by the Intel Xeon processor. Memory modules installed in these servers include parts by the following vendors: Micron/Crucial, Kingston Technology and Samsung. Data storage requirements on SCSI, SATA and IDE standards are met by hard drives from vendors Seagate and Western Digital.